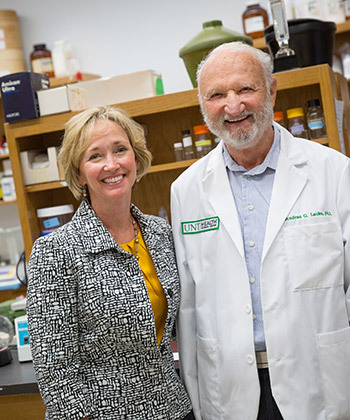 The non-profit organization Rutledge Foundation has awarded a $60,000 grant to fund oncology research being conducted by Andras Lacko at the UNT Health Science Center (UNTHSC). The investigator, who serves on the facility as professor of Physiology and Pediatrics, is studying a drug delivery system expected to both target and neutralize cancer cells. Finding more effective treatments to treat cancer, particularly in young adults, is a cause particularly close to the foundation, since Carley Rutledge was saved from Ewing’s sarcoma due to an experimental vaccine when she was only 15 years old. She won the fight against the malignant bone tumor, is now 20 and attends college, studying conservation biology and chemistry. Therefore, the foundation became particularly focused on young adults that suffer from cancer and the need to find tailored treatments for them, which is the aim of Lacko’s research. The investigator will be granted more space and staff at the recently opened UNTHSC Lipoprotein Cancer Therapeutics lab to accelerate the research. Laura Rutledge, Carley’s mother and executive director of the foundation, explained that during the past 30 years, little has been done to advance Ewing’s sarcoma treatment, which is of great concern. “They basically give these kids as much chemo as they can tolerate before it kills them. The lack of improvement in therapies and dangerous side effects is what drove me to start the Foundation,” she said. Given this lack of advancements to treat the disease, the organization is supporting immune-based targeted therapies, since the foundation believes the future of oncology therapy lies there. “Dr. Lacko’s research appealed to us because he’s using a natural process in the body as a vehicle for chemo so it goes straight to cancer without harming other cells,” added Laura Rutledge. “We are very fortunate to get this support. It allows us to continue doing what we believe will be helpful in the treatment of cancer,” said Lacko, whose investigational drug delivery method is expected to both save lives and prevent patients from suffering the effects of chemotherapy. In addition to Ewing’s sarcoma, the investigator was already studying the approach to treat ovarian and prostate cancer.